Guests press closer to the fire pit, warming feet and faces, as the dusk chill settles over the Rocky Mountains. Cocktail glasses chime through the laughter and chatter. I give the scene wide berth, hobbling across the thick grass. My legs bend and wallow, entirely disobedient. After six hours in the saddle - the first time in 15 years - my limbs are mutinous. They lurch towards the soothing warmth of the flames and the chilled Pinot Grigio on the lodge's log porch. Too late. I've been spotted dithering. "Amanda," a cheerful voice cries out. "What are you doing? Why aren't you here?" "Work." I demur. A chorus of boos floats across the lawn. "Come have a drink, silly. You're not here to work." Actually, I am, but my resolve melts before the campfire and gentle camaraderie. A gentleman relinquishes his chair by the hearth. An unobtrusive waiter slips a glass of white wine and plate of hors d'uvres into my hands. I snuggle up and sigh. These people - strangers until yesterday - called me out of the darkness. Without strain, without pretence, they wove me into their close-knit circle. Some have visited the CLazyU Ranch for more than 50 years. The lawyers, professors and entrepreneurs, so dignified in western couture now, once scarfed s'mores in the children's program. They return the same time each year, greeting old friends, breaking in new boots. "This place has turned into family," one explains. Another chimes in; "It's like intergenerational summer camp. The kids get to tent out, visit the rodeo, brand their leather boots and belts, and watch films. Meanwhile, we sit and drink nice wine." We - the adults that is - do indeed live well. Soufflés and gourmet pancakes greet us each morning. We lunch by the pool after three-hours on horseback. Hiking, trap shooting, tennis, rafting: the options are vast. The ice cream parlor opens twice daily, crafting ornate banana-syrup concoctions, and the bar manager circulates during cocktail hour, topping off glasses with a sincere smile. Then we dine. The long communal tables are blanketed by chef Tom Lee's creations. Rosemary bread, wild mushrooms and long-grain rice, fresh mountain trout, ginger crème bruleè. The portions are mammoth, sized for farm hands rather than sedentary city slickers. I eat and eat, but gain no weight. Perhaps clinging to the saddle horn burns more calories than I thought. The children orbit this stately summer camp, immersed in a world all their own. They breakfast en famille, then vanish with bright-eyed, hearty counselors, who orchestrate the finger-painting, scavenger hunts and pony rides. After dinner, they rejoin the adults for blue-grass music, square dancing or other wholesome - but wholly fun - activities. Each and every one seems deliriously happy. "When it came time to leave, all six of my children begged to come back," a single father observed. "I signed up immediately for the next summer. How often do they agree about anything?" The home-on-the-range atmosphere is largely due to the proprietors, the Murrays, who grew up visiting the ranch. "Some folks are fourth-generation visitors," co-owner Brian explains. "It's increasingly rare to return to the same place year after year, but around 65% of our guests do." I see why. A bold young wrangler, Kate, coaxes me onto a red mare. My last ride was two decades ago, but she has me trotting along hill trails the very first morning. By day three, I'm scaling ridges and fording streams with my trusty steed. No prizes are forthcoming for deportment, but I can handle myself on a horse now. The CLazyU took a rank amateur and introduced her to the sweeping mesas and aspen glades of the Continental Divide. I'd say the process is painless, except for all the undignified hobbling that results from my rides. The ranch has access to 8,000 miles of trail, as well as an indoor, heated arena. Summer homes dot the valley, but the terrain and wildlife are rugged enough to sustain the cowpoke dream (more advanced riders can even help round up the herd). Badgers, foxes, mountain lions and black bears populate the hills. As my horse ambles up a slope, the other riders gesture ahead. "Look at the weird deer!" So we do ... until it registers: Not a deer. Moose. Gawky baby moose. We turn tail rather than face a protective mother, but the thrill lingers a long time. Indeed, we practice the whip-n-wait technique, then roll-casting. Claus, demonstrating how to avoid obstacles, hooks the lone tree on the lawn accidentally. "And this is how you disengage a line without damaging expensive equipment," he chuckles, sacrificing the delicate fly. Two minutes before the lesson's end, my rod bows and I reel in an eleven-inch rainbow, gaping mouth just above the surface. Claus leans down to tweak the hook free, but with a flash and wiggle, the trout wrenches loose and arches back into the lake. Perfect. Just perfect. So that's why I sigh beside the fire, completely content. I have my very own one-that-got-away fishing tale. My cheeks are pinked from fresh air. I am saddle sore, granted, but the sauna left me languid. I've eaten and drank well in good company. And let me tell you, partner, I feel just fine. The ranch is 97 miles west of Denver International Airport (DIA). AMTRAK runs to Granby station (1-800-872-7245; www.amtrak.com). Home James shuttle service runs from the airport to Silver Creek Ski Area 15 miles away (two hour trip, $49 one-way. Tel: 1-800-451-4844. Web: www.homejamestransportation.com), where the ranch picks up guests by prior arrangement. Home James also represents Hertz vehicles - or try Avalanche Car Rental from $49 per day (Tel: 888-437-4101or 970-887-3908. Web: www.avscars.com). CLazyU summer rates range from $2,125-2,650 per person for a minimum seven-night stay (double occupancy). Prices include three massive meals each day, lodging, horseback riding and instruction, ranch activities and a complete supervised program for 3-17-year-olds. Autumn and winter rates begin at $235 per night with 20% discounts for children. Trainer Buck Brannaman, inspiration for the novel and film The Horse Whisperer, offers a special horsemanship clinic in late summer (additional $450 fee. Web: www.brannaman.com). Contact the ranch at PO Box 379, Granby, Colorado, 80446. Tel: 970-887-3344. Web: www.clazyu.com. Grand County is also home to one of America's top ten mountain resorts, Winter Park. A ski train links Denver's Union Station with the slopes from December through April. Room rates drop as low as $29 per person in the summer, when the regions attracts golfers, hikers and mountain bikers (1-800-979-0332 or 970-726-5587. Web: www.winterparkresort.com). Book more intimate accommodations through www.coloradomountaininns.com. Try the Bear Paw Inn for hand-hewn log charm, feather beds and romantic seclusion sans children from $170-220 (871 Bear Paw Drive, Winter Park. Tel: 970-887-1351. Web: www.bearpaw-winterpark.com). The Whistle Stop B&B boasts a homey atmosphere and bottomless cookie jar ($69-99; one block from the Winter Park Amtrak station. Tel: 888-829-2632 or 970-726-8767. Web: www.winterparkbandb.com). Budget travelers prefer the Rocky Mountain Inn, which has elegant dormitory beds from $15.50-30 a night, depending on the season (Tel: 1-866-467-8351 or 1-970-726-8256. Web: www.therockymountaininn.com). Satiate your city-slicker, coffee-and-cake cravings at the welcoming Black Bear Bakery and Cafe in Grand Lake (928 Grand Avenue. Tel: 970-627-0304). Hernandos Pizza Pub boasts over 11,000 decorated dollar bills on its walls. Kitsch motif aside, it serves good pies, especially the whole-wheat crusts (traditionally eaten as desert, slathered in honey). Wash it all down with local Fat Tire Ale (Highway 40 at King's Crossing intersection, Winter Park. Tel: 470-726-5409). EG's Garden Grill is a favorite apre-ski hangout for locals. Vegetarians celebrate its hummus pita with tzatziki, while omnivores praise the shrimp enchiladas and burgers (1000 Grand Avenue, Grand Lake. Tel: 970-627-8404. The inn also rents distinctive rooms: "Squeaky Bob's" even features a hand-painted folk art bathtub. See www.egscountryinn.com). For special occasions, reserve a porch table high on Tonahutu Ridge at Grand Lake Lodge. The thoughtful nouveau menu includes hazelnut-crusted Brie, duck breast with roasted plum and a stew of lamb and wild mushrooms. The restaurant hosts a champagne brunch on Sundays (15500 US Hwy 34, Grand Lake. Tel: 970-627-3967. Web: www.grandlakelodge.com). The lodge also rents cabins, starting at $80 per night. The CLazyU company store sells most of the cowboy kit required, like "stampede straps" for hats and sunglasses. The ranch thoughtfully provides 30-proof sun block, lip balm, combs, toiletries and lavish snacks in each room. However, guests should bring bathing suits, sturdy shoes with a heel (which won't slip through a stirrup) and piles of warm clothes to combat the high-elevation chill. Strapped for cash? Sample the range lifestyle at Snow Mountain, the YMCA of the Rockies, ten minutes drive from Granby. 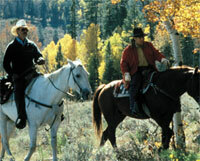 The ranch offers short horse treks, hay wagon rides and winter sleigh excursions on its 5,200 acreas (Tel: 970-887-1999. Web: www.sombrero.com). Trail guides are available from www.winterpark-info.com. Rent mountain bikes, kayaks or snowshoes from Grand Lake Sports (902 Grand Lake Avenue, Grand Lake. Tel: 970-627-8124. Web: www.grandspiritsports.com). Plunge into the Colorado River on a whitewater rafting trip. Witty guides drawl the history of the gorge, as the Hyside inflatables lump over boulders and swirl through eddies. A Mad Adventures half-day trip costs $42.50, full $62. Bring quick-drying clothes, rain gear, sunglasses with a strap, sunscreen, a hat and water-worthy footwear. A splashproof camera and contact lens case are recommended, should you opt for the 30-foot cliff leap into the dark waters (Tel: 800-451-4844 or 970-726-5290. Web: www.madadventures.com). Grand is the largest natural lake in Colorado. The world's highest yacht club (at 8,367 feet) and swanky summer homes attract the international jet set to these deep alpine waters. Five classes of boats race each summer in the Lipton Cup, usually won by natty wooden E-boats. Explore by kayak ($15/hour), three-person canoe ($20/hour) or fishing boat ($40/hour), rented from SolVista Marina in Grand Lake (Tel: 970-627-8158. Web: www.solvista.com). Armchair traveler should opt for the less sweaty lake tour, where guides detail the architecture, history and folklore of the region ... and a motor does the dirty work ($12 adult). Grand Lake is home to the remarkable Rocky Mountain Repertory Theatre. The location may be remote, tucked away in a high, chilly range, but the talent sizzles (town park, opposite the mini golf. Tel: 970-27-5087. Web: www.rockymountainrep.com). Yes, Grandby is that Grandby of bulldozer fame. Vengeful citizen Marvin Heemeye attacked local government buildings, the library, businesses and homes in an armored "tank" cobbled together from a Caterpillar, concrete and Plexiglas on June 4th, 2004. The plucky town's rebuilding with help from its friends. Send donations to PO Box 1501, Granby, CO 80446. Catch up on the saga at http://www.thedenverchannel.com/news/3383547/detail.html. Explore other Grand County holidays at the superb, stylish site www.grand-county.com or www.grandlakechamber.com. 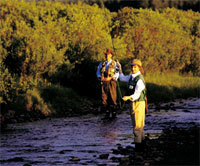 clazyuflyfish: A week at the ranch includes free fly-fishing instructions. Photo courtesy of Grand County Tourism. clazyuhorse: Riding opportunities abound in the Rockies. Photo courtesy of Grand County Tourism.